German start-up BOS — Balance of Storage Systems — says it intends to double the number of its hybrid lead and lithium battery units this year to reach a total of 20,000, chief technology manager Balance of Storage Systems told ESJ’s sister publication BESB on July 3. 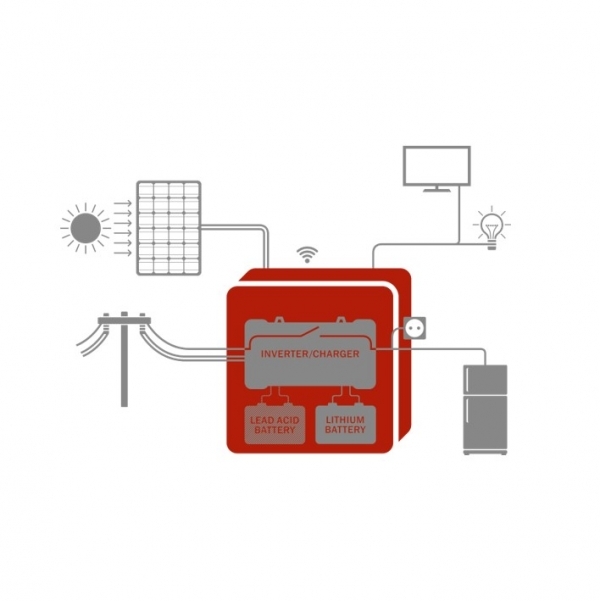 BOS’s systems are used in mini-grid solar applications including one project in Nigeria, a DC minigrid in India, and many are placed with Hymer, the biggest caravan manufacturer in Germany. The product, which includes a PV panel, use a 12V lead battery as back-up and a smaller lithium battery to run most of the daily charging cycles so the lead battery does not have to be discharged so much — which prolongs its life. Kündiger used his own home as an example to illustrate how the two batteries work together, with his 2kWh lithium battery installed with a 10 kWh lead battery. When was the system first developed, and what was the inspiration for it? We started the company in 2014. Ben and I were both working with Peter Adelmann, a professor at the University of Applied Sciences at Ulm in Germany, and we all knew off-grid systems quite well and saw so many lead acid battery systems failing because of sulfation, since the owners didn’t charge the systems frequently. Our idea was to have a cheap lead acid backup battery, while a smaller but more expensive lithium battery runs most of the daily charging cycles and helps the battery to reach fully charged condition. First we developed an all-in-one charge controller, that managed both batteries, and PV. But for many customer requirements, this was not flexible enough. So we developed a modular and flexible lithium extension battery with in-built electronics and all protection features, that is just connected to any 12V lead acid battery. Ben focuses on business development and the CEO role, I am co-founder and head technology and product development, while Peter Adelmann is chairman of supervisory board. Imagine a standard 12V lead acid battery system, like any off grid PV system or a motorhome. When the lead acid battery gets charged, the charger will switch from constant current charge to constant voltage charge. Constant voltage charge means that there is more energy available than the lead acid battery can charge. Now our extension battery, connected in parallel to the lead acid battery recognizes that there is constant voltage charge at an appropriate voltage level and charges the lithium battery by all the overplusses that the lead acid battery can’t take. Once the sun goes down we first discharge the lithium battery, keeping the lead acid battery and loads around 13V. The lead acid battery does not get discharged yet. This way we keep the lead acid battery at a high SOC, while the lithium battery is doing most of the cycles. Both batteries do exactly what they do best. For example in my house, there is a 2kWh lithium battery combined with 10kWh lead acid battery. Since the lithium battery is used each night and lead acid is backup for bad weather days and higher energy demands, there is something like 300 lithium- and 50 lead-acid charging cycles every year. This is enough to give a cycle life of eight to 10 years, while the investment costs were significantly lower than a lithium battery only system. Are there other applications that it could be used for, or is the idea mainly for home solutions? The battery can be used in all kinds of applications that currently use lead acid batteries. The smallest unit we have is 300Wh lithium that fits well with a 12V 100Ah lead acid battery. Beside home storage solutions, we sell many units for caravans and mobile homes. Other applications such as remote PV-powered traffic signals also benefit from the technology, as well as from our GSM monitoring solutions to monitor systems performance remotely. We have been conducting some interesting minigrid projects with this technology as well. Where are these systems being installed, and how many are in operation? The most interesting projects are by one customer in Nigeria who runs some 100 of our systems with a GSM monitoring platform, and an innovative DC minigrid in India. Within Germany Hymer uses our hybrid batteries, which is the biggest caravan manufacturer in our country. Our systems are providing energy to more than 10,000 end customers. Our target is to double this number this year.